(Nanowerk News) Neutron scattering experiments performed at the Department of Energy's Oak Ridge National Laboratory give strong evidence that, if superconductivity is related to a material's magnetic properties, the same mechanisms are behind both copper-based high-temperature superconductors and the newly discovered iron-based superconductors. The work, published in a recent Nature Physics, was performed at ORNL's Spallation Neutron Source (SNS) and High Flux Isotope Reactor (HFIR) along with the ISIS Facility at the United Kingdom's Rutherford Appleton Laboratory. A simulation of the nature of the spin excitations in a superconducting material's structure. Studies performed at DOE's Oak Ridge National Laboratory support theories that magnetic properties play an important role in high-temperature superconductivity. High-temperature superconducting materials, in which a material conducts electricity without resistance at a relatively high temperature, have potential for application to energy efficient technologies where little electricity is lost in transmission. The research community was stirred in 2008 when a Japanese team reported high-temperature superconductivity in an iron-based material. Previously, only copper-based, or cuprate, materials were known to have those properties. The discovery elicited widespread and intense analysis of the material's structure and properties. "The pairing up of electrons is essential for the formation of the macroscopic quantum state giving rise to superconductivity," said lead researcher Mark Lumsden of ORNL. "One of the leading proposals for the pairing mechanism in the iron-based superconductors is that magnetic interactions, provide the glue that binds the electrons together." Detailed studies of the magnetic excitations of materials are essential for understanding high-temperature superconductivity. Although superconductivity near absolute zero is common, only certain materials exhibit the property at "high" (i.e., the temperature of liquid nitrogen) temperatures. The ORNL researchers subjected single crystals of an iron, tellurium and selenium material to neutron scattering analysis at the SNS, HFIR and ISIS. "Even in comparison to cuprates, this is experimentally the best indication of what the spin excitations are doing. One of the prominent views is that spin excitations are a key ingredient. The first step in evaluating this proposal is understanding what the spin excitations are and what they are doing," Lumsden said. Neutron scattering analysis is considered to be among the most powerful techniques to understand the molecular structure and interactions in advanced materials. The newly available pulsed-neutron source intensity at the accelerator-based SNS, combined with steady-state neutron beams from the recently upgraded HFIR, give researchers at Oak Ridge valuable new tools for understanding these properties. "Neutron scattering is the only way to study the full wave vector and energy dependence of the spin excitations that are believed to be behind these superconducting properties," said co-author Andrew Christianson, who with Lumsden is a member of ORNL's Neutron Scattering Science Division. The researchers performed time-of-flight neutron scattering measurements with the Wide Angular Range Chopper Spectrometer at the SNS, which opened in 2006 and is currently the world's most powerful pulsed-beam neutron source. Time-of-flight experiments were also conducted in England with the Merlin chopper spectrometer at ISIS, another leading neutron source. Triple-axis neutron scattering experiments were performed at HFIR in Oak Ridge. 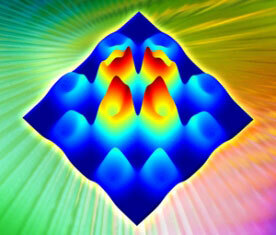 The single crystals were synthesized and characterized by ORNL's Correlated Electron Materials group. The team includes principal authors Lumsden and Christianson; Eugene Goremychkin of ISIS and Argonne National Laboratory; Stephen Nagler, Herb Mook, Matthew Stone, Douglas Abernathy , Gregory MacDougall, Clarina de la Cruz, Athena Safa-Sefat, Michael McGuire, Brian Sales, and David Mandrus of ORNL; and T. Guidi of ISIS. The research was sponsored by the DOE Office of Science.